Bill O'Reilly Calls Glenn Beck Insane, Glenn Beck Calls His Viewers "Zombies"
Glenn Beck's doing well in the ratings these days. So well, that Bill O'Reilly doesn't mind letting his viewers know what he thinks of Beck, and that Beck doesn't mind letting his viewers know what he thinks of them. Frankness? It's an underrated virtue. When these two get together, it's usually pretty fun. You can enjoy the quiet seething of Bill O'Reilly, who'd probably rather have thought of Beck's shtick first, if it weren't so beneath him. 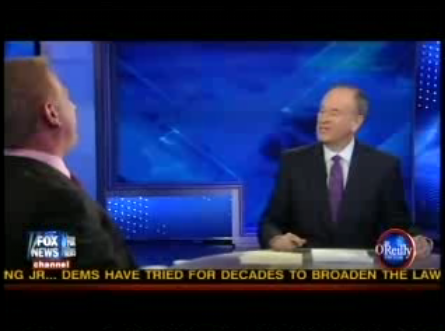 The setup: Beck and O'Reilly are arguing about the Swine Flu shot. Beck will not disclose whether or not he'll get the shot. O'Reilly will get the shot; he thinks it's better for the general public that he doesn't infect everyone around him. Any symbolism here is purely coincidental. Beck jokes that his viewers are zombies. There's never truth in any joke, ever. Bill O'Reilly suggests that Glenn Beck might be the highest rated pundit in sincere need of mental health care. Bill O'Reilly might have mixed feelings about Glenn Beck.